Francisco Ramos moved to Los Angeles in 2006 to do improv but made the leap to standup, lured by the appeal of relying only on himself, "With improv, you always have to be working with people who are on the same page as you and can stay on the same page, with standup, it's just you." He started hitting open mics and spending time at The Comedy Store, and jumped in, running the music on one of the shows in the Belly Room. 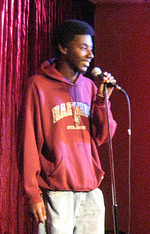 Young Adam Ray had a dream of an SNL cast member and saw that most everyone on the show came by way of standup, so he'd sporadically do sets in Seattle, then later at his frat house and on Vargus Mason's shows. He always had a good time, got some laughs and, thanks to his theater background, never felt intimidated onstage. He kept this up for a while, while also putting his energies into improv classes at UCB and acting. But then he realized he needed to pick a path and that to get good, he had to dive in and start grinding. "The only way to really do this is to get into the hustle. Sure there's books and classes, but it's mostly learning on the fly. But I'm in favor of sharing my experiences because I had guys like Bret Ernst who took the time to give me a lot of wisdom because he didn't have a lot of people there to show him the ropes." I love Jerrod. Okay, I love a lot of people in comedy, but that shouldn't dilute the fact that Jerrod is awesome. Everybody loves Jerrod, not just me. He's got the kind of open heart and positive attitude you don't often see in people who embark on a career in comedy, much less maintain once they're in the thick of it. In my mind, Mat Edgar's journey from open miker to Paid Regular is the archetypical one - through the bowels of the Comedy Store itself, like working your way from single-A up to the majors. And Mat's a fascinating combination of things - he can be mean, cynical and narcissistic while simultaneously being the most earnest, wide-eyed, open-hearted guy on earth. One of my favorite moments when I first met Mat really encapsulates this. One night, in the back of the kitchen, a somewhat heated conversation about success and friendship led Mat to give an impassioned "Mr Smith Goes to Washington" style speech about how everyone in the room felt deep in their heart that they were funnier and deserved more success than everyone else in the room. Which is flat out true - you can't get anywhere in comedy unless you have that kind of narcissism in your very core. It was just so interesting to watch as he both laid bare his own arrogance and came to realize a fundamental truth the rest of us already knew, either consciously or unconsciously.